Opening times Tue–Sat noon–2.30pm & 5–10pm. Seasonal times Closed 25 & 26 Dec, 1 & 2 Jan. Almost 20 years since he left Le Gavroche to set up on his own, chef/patron Brian Maule remains a visible presence at Le Chardon d’Or, personally running the kitchen to ensure that every dish that leaves it is up to his own high standards. The name (translated as Golden Thistle) is a giveaway to the marriage of classically Gallic techniques and luxury Scottish ingredients found within. His multi-level space is configured to accommodate corporate entertaining at a large scale, while retaining the original features of its Georgian townhouse setting – peaceful and elegant with soft lilac walls and thistle motifs on the blinds. Dishes are as rich and complex as you’d expect with this pedigree – a starter featuring pan fried scallops, spiced cauliflower puree and rice crackling is abundant with different textures and flavours, and generous with the seafood. Main courses are equally inventive, and a separate vegan menu keeps up with the times. Every foodie in Glasgow knows about Le Chardon D’Or. Brian Maule’s converted townhouse in the financial district still sits firmly at the top-end of places to dine in this fair city. His classical French training – a decade under Michel Roux Jr – and well-established relationships with local suppliers ensure Scotland’s natural larder is used as sensitively as anywhere else in town. Inevitably it’s pricey – but these are dishes of complexity and accomplishment (with generous portions too). Starters like a trio of duck show the thought involved: delicate strips of cured breast beside the fatty-roughness of confit terrine and the smooth-richness of foie gras, with the sweet crunch of pistachios livening things up. Elsewhere, a luxurious raviolo is packed with flavours – ham hough giving way to chicken, the dish bound in a truffle veloute that Michel would call ‘unctuous’. Technical ability is evident throughout. An assiette of pork gets the most from various different cuts to achieve a plate of refined meaty comfort, while seldom-served gurnard – as meaty a fish as you’ll find – is sliced, flashed and confidently set against a fennel marmalade. Big flavours, marvellously balanced. 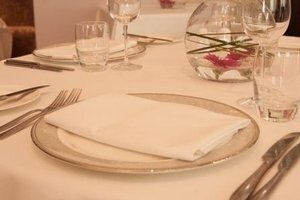 With Glaswegian eateries increasingly tending towards a less formal approach, the ‘Golden Thistle’ is now one of only a handful of restaurants in town that give the full white linen/suited waiters service that’s more easily found in places like Edinburgh and London. Dining here is a treat. And the early-evening menu makes it a pretty affordable one, too.